Click here to purchase from the new website: Best Dementia Help. A 26 minute DVD movie presentation of over 260 still photos relating to a visit to the beautiful garden setting of Adelaide Zoo with its wide variety of animals and birds, and the open plains setting of Monarto Zoological Park with its mostly African and Asian animals. Accompanied by background music and occasional animal and bird sounds – no captions or narration, to enable easy viewing and listening, and reminiscence. Play the preview video. Photographed entirely in Australia but many of the animals are common to zoos throughout the world. 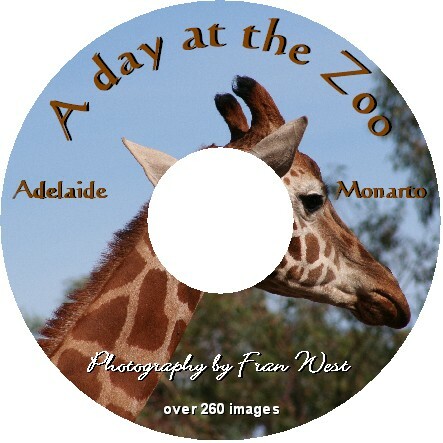 Ideal to link this with A day at the Show DVD, More Amazing Animals DVD and African Animals Jigsaw Puzzles CD. All the DVDs are produced in the PAL format. CLICK HERE to see whether your country uses PAL. If your country uses a different format, DVDs can be viewed on a multi region DVD player, a portable DVD player or a laptop (with a DVD drive) which can then be linked to a TV screen via a cable. Men's Reminiscing Mats Series 2 "Limited Edition"
Women's Reminiscing Mats Series 2 "Limited Edition"